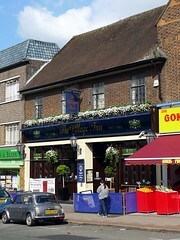 A Wetherspoon's pub near Rayners Lane Station. This is a fairly standard shop conversion pub, long and thin. The front area by the bar is fairly small with only a few tables, but down some stairs is plenty more booth seating, though it's much darker than the front of the pub, even when it's sunny outside. Out the back is a decent sized and functional beer garden space with plenty of tables, including a standing area for smokers under cover. There are seven handpulls for ale with the usual options including Ruddles, Abbot Ale and guests, and standard lagers on draught. Accessibility: There are no steps to get in at the front (where the bar is), and there's an access road to the beer garden and seating at the back of the pub (where the toilets are), but there are several steps between these two areas. Last visited by Ewan, Jo and Tube Walkers, 13 April 2009. Opening hours taken from website, April 2009. Last edited 2017-09-15 18:31:50 (version 10; diff). List all versions. Page last edited 2017-09-15 18:31:50 (version 10).